The Nukes from West Auckland are far more than a ukulele band. Part vaudeville, part rat-pack, part musical car crash, this talented trio deliver an engaging mix of humour and originality that audiences of all ages will love. The innocent little uke is the instrument of choice and folk will be staggered by what they are able to achieve with it. Great songwriting, musicianship and 3-part harmony combine to create a truly memorable entertaining experience. 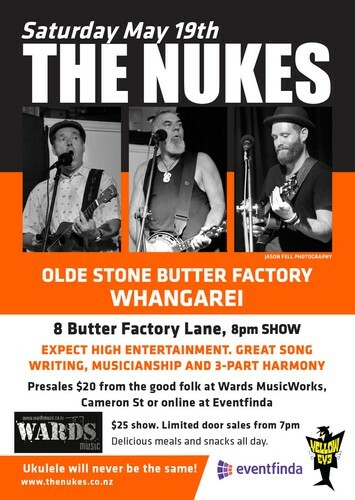 Old Stone Butter Factory show Saturday May 19th, doors from 7 pm, show at around 8.00pm. Physical tickets also available for the show from Wards Musicworks Cameron St. Limited door sales available.